So I've been edging closer to lacto-fermentation as a preservation method. There are still some nice looking cabbages out there in my garden. And though significant work has been done on turning a corner of our basement into a root cellar (I know, I haven't posted about this before), we haven't had any properly frigid weather to bring it down to a good temperature, and truth be told it still needs work. The thing that's kept me at arm's length from lacto-fermented products is that I don't like pickles or briny-tasting things. I can't stand olives or capers, and have never understood the appeal of pickled cukes. I've revisited these particular disliked foods and tried to have an open mind, and just found that I really genuinely dislike these things. That said, I have enjoyed kim chi in the past, and I love pickled ginger. So it seems to me that there's some room for optimism that I can make this method of preservation work for us. Why would I even contemplate trying to work around firmly entrenched food aversions of mine? Well, there are some pretty impressive upsides to lacto-fermentation. For one thing, it's just about the lowest energy-input form of food preservation. You don't need to heat or significantly chill the food being preserved; a cool room will suffice. Over and above that though, lacto-fermentation is the only form of food preservation that gives you a product with more nutrients than the raw food contains. How does that work? The microorganisms doing the lacto-fermentation partially breakdown the food and in the process make more nutrients available to us than our own digestive systems can manage alone. The icing on the cake is that those microorganisms also create narrow-spectrum antibiotics that protect us from a handful of the most common food borne illness culprits (e. coli, listeria, clostridium). So when you eat lacto-fermented foods, you're protected in multiple ways from dietary related illness. So here's where the wheels in my brain really started spinning. Say you're a nutcase like me, and you're trying to provide as much of your own food as possible on a fairly limited amount of land. You have two challenges: produce enough calories, and produce enough nutrients. Most garden plants give you nutrients, but not too many calories. In order to provide both nutrients and calories you must allocate garden space to crops that supply these two different needs. Lacto-fermentation shifts the space requirements for these two goals. Let's say, for simplicity's sake, that you divide your 1000 square foot garden into two equal parts: one devoted to cabbage, and the other devoted to potatoes. Cabbages provide excellent nutrition (as well as fiber, by the way), while potatoes are an excellent calorie crop. Let's also say that you can technically meet your family's nutritional needs for the year with 500 square feet of cabbage. But perhaps 500 square feet of potatoes will only provide 40% of the calories needed to feed your family each year. If you can double the nutrition provided by cabbage through lacto-fermentation, you could sacrifice half the garden space given over to this crop without jeopardizing the nutrient needs of your family. If you give that space over to calorie crops, you could get that much closer to self-sufficiency. My numbers here are entirely hypothetical. I don't know how exactly how much more nutrition results from lacto-fermentation. It probably varies by the vegetable or fruit that is lacto-fermented. Nor do I know how much space is needed to produce 40% of an adult's caloric needs in potatoes. But what's clear is that lacto-fermentation is an important tool that could allow some garden space to be reallocated to calorie crops without sacrificing all-important nutrition. The implications of this are potentially huge for those producing food on small plots of land. More nutrition from the same space, or the same nutrition from less space. I firmly believe that finding ways of increasing food production on - and food value from - small spaces is going to be critically important to future generations. I'm going to try really hard to find lacto-fermented foods I enjoy eating. I'll start today with a homegrown head (or two) of cabbage, and will post later on how it goes. I plan to explore this method of food preservation over the next year. An acquaintance of mine fairly rhapsodized about a sauerkraut her mother used to buy from a Jewish market that included fresh cranberries and was seasoned with caraway. That sounds delicious to me! If you have any tried and true recipes for lacto-fermented vegetables (especially cabbage), I'd love it if you'd share them or point to them in the comments. And wish me luck! We finally got our garlic planted yesterday. We aim for a week after first frost, and that event was rather late this year. It's both counter-intuitive and oddly reassuring to plant things this late in the year. I've had excellent results in growing hardneck heirloom garlics in my zone 6 garden. So I thought I would describe my method. First things first: I prepare a bed that I have not used to grow garlic in the past three years. This helps protect garlic from just about the only thing that threatens it: fungus that attacks the roots. I scrape down any weeds, leaving them in place on the soil. To them I add a few leaves from my comfrey plants to act as a green manure, albeit not a living one. Comfrey is a deep-mining bioaccumulator of many nutrients, bringing these minerals to the surface where they can be made accessible to other plants. I make sure the comfrey leaves wilt for several hours in the sun before burying them. The plant has astonishing powers to root itself from cuttings. 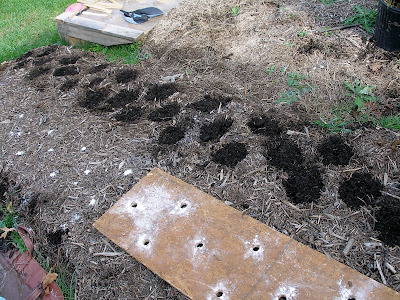 After that I work the ground over with the broadfork and then apply the lasagna/sheet mulching method. So much for the bed. The night before I plant my garlic bulbs, I break down the heads of each different type of garlic into individual bulbs, leaving as many of their papery coverings intact as possible. The wrappings protect the bulb from viruses and other unwelcome intruders. Given the damage to this year's garlic crop from our incredibly wet June, I looked over the planting candidates with a very careful eye, rejecting any that showed signs of damage or rot. Those that made the cut got my standard pre-planting treatment. This consists of a soak in a mixture that is both anti-fungal as well as nutritive. It's a mixture of 1 tablespoon of liquid seaweed fertilizer and 1 heaping tablespoon of baking soda mixed into one gallon of water. 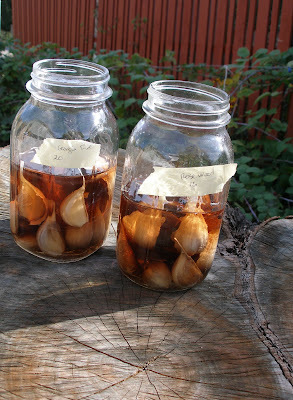 The bulbs soak in this mixture overnight, with each garlic variety I plant in a separate mason jar. They soak for 16 to 20 hours altogether. The day of planting, I pour about two cups of flour into a container and then rummage around in the garage until I locate my planting template. I made this template from a piece of scrap particle board I fished out of a dumpster. The template has 18 holes, each spaced 8" apart, which is slightly generous spacing for garlic. Originally I had intended to plant the garlic directly through the template, but that didn't work out when I saw how large the bulbs of some heirloom hardneck varieties are. Instead, I lay the template down over a well prepared bed, and dust the flour down every hole. When I take the template away, I can easily see where the bulbs should be planted. 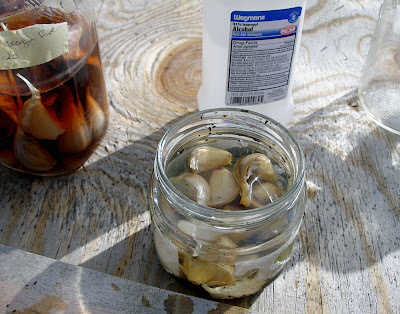 Just before it's time to plant, the bulbs come out of their seaweed and baking soda soak, and go into a much briefer soak in rubbing alcohol. This additional disinfectant soak lasts for just 3-5 minutes. We've used 70% rubbing alcohol in the past, but this year it was 91% pure. While the cloves soaked, my husband did the hard work of making a deep narrow hole at each of the floured spots, punching straight through the newspaper in the lasagna mulch. I try to get the cloves about 4" deep, but sometimes it's difficult to tell exactly how deep they are when I have a lot of mulch on top of the ground. This year I added good compost down each hole dug for the cloves. This year's bed was built in late summer over lawn, so I figure the garlic could use some extra help. That's pretty much it. I don't even water the bed usually. We have enough rainfall in our area that it's not needed, and the bed is pretty well protected from drying out. It's raining today. The garlic shoots have no trouble making their way through the lasagna mulching. They just come straight up through the hole I punch in the thick newspaper layer with the dibble. The key is to avoid walking on the bed after planting, even though it looks like an empty space in the garden. Garlic requires more advanced planning and a longer time in the ground than other annual plants. But the payoff is that we eat homegrown garlic from July to December at least. This year we planted a softneck variety too, which should store better after harvest, in hopes of extending our homegrown supply into the spring months, or at least late winter. So here I am in October 2009, thinking about whether or not we'll have homegrown garlic to eat in February or March 2011. Although I started growing garlic in 2007, we're now eating from our second harvest of this crop and wondering how long we can manage to store it. 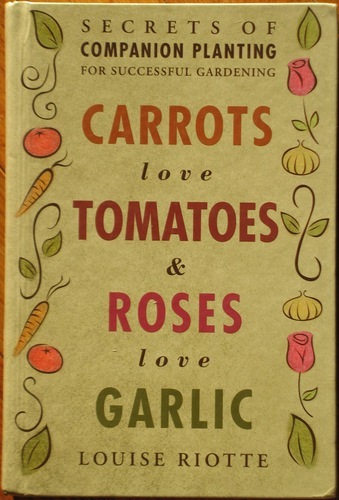 No wonder it takes so long to feel like I know anything about gardening. The gardening season isn't quite over yet. We had a week of miserable wintery weather which gave us just one frost, and now it has rebounded into a week of Indian summer. We still have leeks and parsnips to look forward to, whenever we can dig them up in the cold months, and the Jerusalem artichokes as well, a new trial for us this year. All these can wait on more serious frosts. There are cabbages to be brought in any time. The popcorn is in but neither shucked nor weighed, let alone popped. But most crops are finished up for the year. So it's time for the post-game commentary. New this year were a couple of eggplant (aubergines for you folks from across the pond) varieties that I tried from seed. While I got them to germinate, I didn't manage to get them to a decent size for transplant by the time they should have been in the ground. Fortunately, a local nursery had at least one of the varieties I wanted to try. 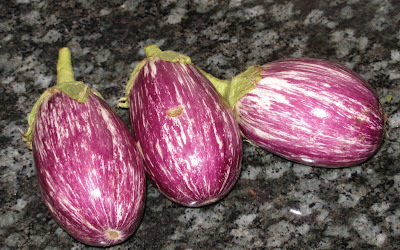 The Listada de Gandia is a "graffiti" type eggplant. It did pretty well here considering how weird the weather was this year. Three plants gave us a total harvest of almost 9 pounds. I liked having our own eggplant, and we could have done with a good deal more. I experimented with the last batch to come in, dipping slices in egg and bread crumbs and then freezing on trays. My hope is that this will lead to wintertime eggplant parmesan. Next year I hope to have at least six plants producing well for us. I think I will also stake the plants next year. Even though I harvested before the fruits got too big, some of the branches trailed on the ground. I think staking would help the plants significantly. For all I know, this may be standard practice with eggplants. The weird weather definitely affected our peppers for the worse. We had few poblanos that ripened up fully before the weather turned cold. So I wasn't able to try making my own ancho chili powder this year. Peppers are such prima donnas. It seems to me that to ensure a decent crop I really need to have plants quite large by the time I put them in the ground. We just can't rely on the truly baking days that peppers need to do well until late July or even August. Some years of course July is viciously hot. But not this year - not at all. Having the plants larger when they go in the ground seems like the obvious strategy. The tomato crop was pretty much a bust this year. The blight hit the potatoes first, but did much more damage to the tomato plants. I got very, very few of either of the beefstake varieties I grew - Brandywine and Cherokee Purple. Both the Peacevine cherry tomato and the paste variety Speckled Roman resisted the blight better, though both were affected. The Speckled Roman was the clear winner this year, and I will definitely grow it in future years. In fact, I think my search for the perfect paste tomato is over. Not only did the plant resist blight, but the flavor was outstanding for a paste, and it's just a gorgeous looking tomato. I will of course keep growing Brandywines and Cherokee Purples, but it's a valuable lesson to see how poorly they both did in a wet year with blight. My Blue Solaize leeks are looking very nice again this year. So far this variety has been trouble free for me, and only required a small amount of attention through the growing season. Now that they're about done growing I will soon heap them up with lots of loose straw. As I did last year, I plan to harvest them from now until springtime. If necessary I can literally chop them out of the frozen earth during a thaw, allowing the soil around the extracted leek to warm up before knocking it off and bringing my wintertime treasure inside. I tried two new varieties of winter squash this year, directly seeded. Neither of them were successful. One stella blue Hokkaido squash made it past the seedling stage and produced a few small fruits. The triamble seeds I was given for free didn't make it at all, unfortunately. I was really hoping to get a triamble or two for fall decoration, as well as eating. So obviously the direct seeding method that worked great for the pumpkins last year didn't work too well for us with the squash. The one early volunteer that I spared came true enough to form to give us a few pumpkins. So that's a nice return. I will probably try again with winter squashes next year but at least get the plants to germinate and form some roots inside before setting them out. Squash roots become very extensive very early, so balancing the need for root development against the risk of root binding will be tricky. This was the last year to attempt melon cultivation and it was a total bust. Like the winter squashes, the seedlings emerged and then died. I was lukewarm on the melons anyway, even though the Charantais melon we got seeds for sounded so good. Either I don't have the touch for melons, or they just don't work where we are. Whatever the case, I don't think we'll try again with melons anytime soon. We didn't really miss them much. Despite the late blight, I can fairly say that our four heirloom potatoes produced a very successful crop. If blight is a risk in your area and you haven't read the post where I describe the good advice given me by an agricultural extension agent, I urge you to read it. His advice helped me salvage what might have been a total loss. We harvested 100 pounds of potatoes this year, and saw the results of my first experiment in container growing for spuds. I am encouraged to explore further with containers for potatoes, because the benefits were many and significant. The blight affected the container grown potatoes last of all; there was no damage to any tubers from underground rodents; not one potato was speared by my pitchfork during harvest; and dumping a bucket of dirt and spuds into a wheelbarrow is a lot easier on my back than digging for them in the earth. Also, putting the potatoes in containers means that I could grow them on the edge of the driveway, which is otherwise useless for cultivation, and free up some garden space at the same time. I plan to try more than one variety next year in self-watering containers, hoping to improve on the quite respectable yields I saw in containers this year. The sodden late spring devastated the Hutterite soup beans. I found out that light colored beans are more susceptible to rot than dark beans. True enough, my black Cherokee Trail of Tears beans climbed ten feet of bamboo pole and are still hanging on. The pale yellow Hutterites failed utterly. I don't know whether I'll brave the uncertainty of pale beans in the future, or stick with the darker, surer varieties. We'll see. The red-cored chantenay carrots never developed any red coloration, though they grew well. I'll probably plant them again, and with more attention to protecting them from the rabbits, who loved to nibble down the tops. In the cold frame I have a hardier variety, the Napoli. We'll see how that does. In the herbal department, lemon balm was a new trial for me, along with lovage, lemon thyme, and anise hyssop. The lemon balm showed the exuberant growth of its family (mint), which allowed me to cut and dry a great deal of it. I've quite enjoyed drinking a cup of the tea after dinner as an aid to sleep. 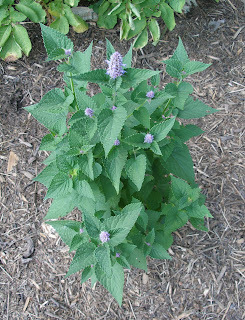 The long flowering anise hyssop was a lovely surprise, much loved by the bees. The leaves have a remarkable sweetness that I included in some fruit pies and even muddled into a few summertime cocktails. It can be killed by severe winters, so I'm hoping ours isn't to bad this year. The lovage and lemon thyme did well enough, but I sort of forgot about them for the most part and haven't really explored their uses much. They should survive the winter just fine though, so there's always next year. As for perennials, the everbearing raspberries we put in this year have been a disappointment. They produced, but had so little flavor we could hardly be bothered to pick them. 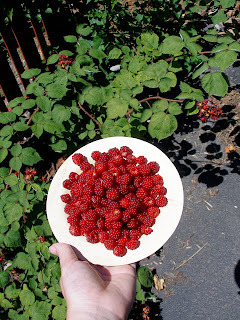 On the other hand, the wild wineberries that line our driveway produced abundantly, had tons of flavor, and, unlike the raspberries, were of no interest to the Japanese beetles. Not sure what to do about the raspberries. Perhaps they need another year to settle in and establish good roots. Perhaps they'll do better next year. If not, the space they occupy is too valuable to let them remain. They'll need to be replaced with something more useful. The grapes and blueberries are not yet producing, nor are the cherry and pear trees we put in this year. The beds of Jersey king asparagus exploded in their first year, and with admirable discipline we forebore to pick any. They got a mycorrhizal root dip, lots of good compost to grow in, and plenty of sun, so perhaps this explains their exuberance. We get to harvest our first limited crop next spring. I can't wait! Well, that's about it. How did your garden grow this year? Rather a hectic day today. Contractors at work in the house. Husband needing a ride to the airport. A warmish day after the first frost of the season, and gardening tasks beckoning. I topped the Brussels sprouts today, which apparently will convince them to get busy building what sprouts they have set. I hope it works. The sprouts out there are mostly nubbins so far. This is what happens the first time you try to grow something. But those tops I cut off...they look ever so much like cabbage leaves - no surprises there as they're all one big happy family. I brought them in and wondered what to do with them and the last two tomatoes I found hidden on a trailing tomato vine on the ground. There was sushi rice leftover from packing my husband some lunch to travel with. And of course there are always eggs from the girls. So I decided to make a dish that is either traditional in the Philippines or else invented entirely by me on the basis of rumor and innuendo. I've never been to the Philippines, nor studied their cuisine, nor even known anyone of Philippine origin beyond the most cursory acquaintance. But I seem to remember hearing that they like to eat fried eggs over fried rice with garlic and red chili pepper flakes. This may be a figment of my imagination, or a misinterpretation, a mis-remembering, or whathaveyou. But nonetheless I adopted this dish and added quick cooked greens as a very easy dinner when the stars are all aligned. I've made it with beet greens and mustard greens. It's all good, as were these Brussels sprout tops. The tomatoes tonight were a novel addition. Start with a clove or two of garlic, some chili pepper flakes, leftover rice and a generous bit of neutral cooking oil. Thinly slice the garlic and saute it for a minute or two in the oil over medium-high heat. Let the garlic begin to brown, but don't allow it to burn. Add a pinch of chili pepper flakes and then almost immediately the rice. Stir the rice around until it heats through, adding a dribble or two of water if the leftover rice is dried out. When it's warm, portion it out on the plates. Add a bit more oil to the pan and add some tender greens. Cook over medium-high heat, adding a bit of water if necessary to help them wilt. Sprinkle with salt or a dash of soy sauce. If the greens are from the cabbage family you may want to cover with a lid and let them wilt properly for a minute or two. When warm and wilted, add the greens to the plates alongside the rice. Finally, reduce the heat to medium and add just a touch more oil, if needed, to the pan. Fry one egg per person, adding a smidgen of chili pepper flakes and salt to the eggs as they cook sunny side up. 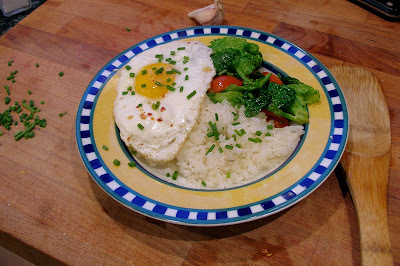 When the eggs are cooked to your liking, add them over the greens and rice. Garnish with finely chopped scallions or chives if you have any. I particularly like using leftover sushi rice for this dish as it adds a nice vinegar tang to the flavor profile. This isn't high brow food. It isn't food from my upbringing. But this is quintessential soul food on a chill autumn evening. The tops from the Brussels sprouts provided the perfect amount to serve just one tonight, and only one dirty pan. It hit the spot. P.S. If you know anything about the Philippines' cuisine, please enlighten me. Sharon posted recently on her craving for retail therapy and other forms of escapism. I can relate. My preferred form of escapism is fantasy fiction, though I long nurtured the not-so-secret conceit of good taste when it comes to literature. I've been re-reading Ursula K. Le Guin's Earthsea series, and relishing every line of her austere, majestic storytelling. But strangely enough, I had a couple of wallops straight to the gut while reading these novels. "And the truth is that as a man's real power grows and as his knowledge widens, ever the way he can follow grows narrower: until at last he chooses nothing, but does only and wholly what he must do..."
"Once when my lord the Archmage was here with me in the Grove, he said to me he had spent his life learning to choose to do what he had no choice but to do." These brief passages spoke to me powerfully. 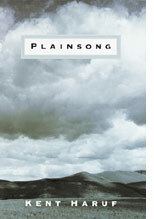 I'd read these books years ago, and loved them. But if I took any note of this idea back then, it was most likely with a sense of dread that ethics might someday constrain my freedom, my choices, frivolity, my ability to indulge my whims. The world looks very different to me now. I see that each action of mine has consequences. And I know that most of those consequences affect other people - people far away, and people yet to be born, and other living things as well. I have a sense of myself and my place within the larger pattern of life. Yes, the way I can follow now is narrower and, by the looks of things, becoming ever more so. Yet I don't feel constrained. This is not something imposed on me, and it's not a burden I resent. It is my path. I don't claim that it is either easy or perfect. On the contrary, it is difficult and involves a great deal of struggle, and I'm still learning to choose. But I can say that on this path, my heart is less heavy. I choose, more and more often, to do what I have little choice but to do. I can no longer turn away from that responsibility. While the path before me is narrow, there is a deepening, a sense of putting forth roots, of finding my purpose, of integrity and homecoming and wholeness. I'm hinting here at what cannot be fully expressed, but that thing is what allows me to continue willingly and happily. 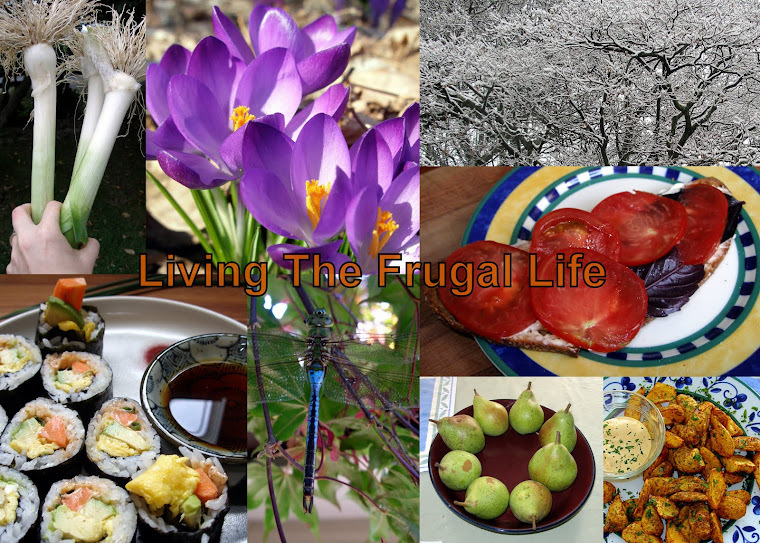 What began for me as a shift to a more frugal lifestyle has become a life path of much larger dimensions. Frugality is still a part of much of what I do, and I desperately want us to be free of our mortgage debt. But thrift has become almost an incidental. More central now is the idea of restraint, of finding a way to live my life within means that are sustainable and just. And when I have time to raise my head above my own tasks, I have visions of sharing what I have learned. Sharon's Jewish faith charges her to contribute to the "repair of the world." It's a daunting command. As an atheist, religion offers me no motive, neither the promised rewards nor punishments. Nevertheless, motivation has found me, and I am willing and even hoping to be a small part of the repair of the world. I know this isn't the usual fare here at Living the Frugal Life. Thanks for listening. 74 pounds of potatoes. That was our one-day harvest on Wednesday. I had hoped to wait for our first frost to harvest the potatoes that remained in the ground. A frost would have given us just a bit more confidence that the blight wouldn't settle on the tubers after harvest and then rot them in storage. But the weather has not been cooperative. We've been hit with downright wintry temperatures which all but halt garden growth, but which will also just not drop below freezing. We're waiting on the first frost to put in the garlic as well. So. The potato harvest. It took us about three hours to bring in those 74 pounds. Admittedly we weren't working like demons. By the end I have to tell you that the bucket method was looking better and better. We speared a few of my beloved Sangre potatoes with the pitchfork while harvesting, and found some that had been pretty well gnawed by rodents underground, voles perhaps. Neither of these things happen with potatoes grown in buckets. Also, my lower back was really feeling the strain. 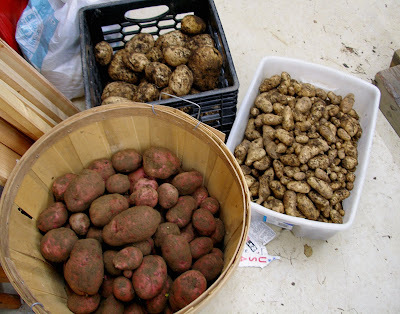 Our total potato harvest for the year came to just over 100 pounds of Sangres, La Rattes, German Butterballs, and Kennebecs - four heirloom varieties. We planted about 11 pounds of seed potatoes, so our overall yield is a quite successful 9 to 1 return. Pretty amazing considering the late blight we got hit with. Yesterday I made a harvest soup with the potatoes damaged by the pitchfork, plus our own leeks, carrots, kale, herbs, garlic, and chicken broth. The only ingredients we didn't produce right here on 2/3 acre were a little olive oil, kosher salt, and white pepper. More satisfying than I can express. The Sangres seemed noticeably larger this year than I remember them being last year. I love these for their incredibly silky, creamy texture. The La Rattes are a fingerling variety which are a real pain to harvest out of the ground because they set so many teeny tiny baby potatoes. But the La Rattes we roasted last year had the most intense potato flavor I've ever tasted in my life. These may well be the best candidate for bucket growing next year. Kennebecs are large baking potatoes that I like to have on hand when I want the potato to be the main course for dinner. A baked potato with some cheese and kale on top works for us as dinner. The German Butterballs were our new trial this year and they have become an instant favorite of my husband. They have a beautiful golden color and are sized very nicely for boiling and mashing. Their flavor explains the second part of their name. I've no idea what last year's potato harvest weighed, so I have nothing to compare this to. But I suspect we will not buy any potatoes this year. We'll simply eat these until they're gone and then go without until next year's crop is ready. I've offered to supply the potatoes for our family Thanksgiving feast to feed 17 people. So that will take a significant chunk away from our stores. I'll be paying attention to when we run out of spuds. If we run out well before they show signs of sprouting, I'll plan for a larger harvest next year. How did your spud crop do this year? This month's Frugal Action Item may cost you money. There's an old saying that, "the first wealth is health." So this month I'm going to recommend that you invest some of your money in safeguarding your well being. There's hardly a safer investment, after all. Come inflation or deflation, the health of you and your family is always going to be priceless. Tetanus shot Even some of the anti-vaccination folk are accepting of tetanus shots. I don't think there's any downside to this particular vaccine. Puncture wounds can happen to anyone, even those of us who don't travel to faraway places with odd diseases, and even to those of us who don't rub shoulders with hundreds of strangers in the course of a given day. Get a tetanus shot if you haven't had one in the last ten years. I know not everyone believes in getting a flu shot. Having once had influenza (the real thing, not the common cold that people call "the flu"), I do. I'm not going to argue the pros and cons of flu shots here. I will say that if you have no objections to such things, don't let inattention or procrastination be the reason you go without one this year. Self examinations This one won't cost you anything. If you've never been one to do the routine but recommended medical self-checks, it's time to change that. In the interest of full disclosure, I'll admit that for too many years I neglected my own breast checks for any lumps that ought not to be there. Nor do I keep track of my moles as well as I should. (I have constellations of moles.) This is simply stupid on my part. Self checks cost nothing but a few minutes of my time on a regular basis, and this sort of negligence could mean the difference between having a small tumor taken care of at an early stage, and death itself. Not to mention the expense. Money ought to be an afterthought when it comes to battling cancer or some other disease for your life, but that's just not a reality for many people. Major medical conditions do no favors to even the best padded bank account. Do your self examinations. It's a matter of valuing yourself and showing fundamental self-respect. If you have dependent children at home, it's also a form of providing them with the best possible future. Dental care If you've been ignoring a low-grade dental health problem, now is the time to get on top of it. A few conditions, like gingivitis, can be conquered with improved dental hygiene and perhaps an extra couple of professional cleanings. If you've got a toothache, unattended cavities, or gum disease, these problems are not going to clear up on their own. Get to a dentist and have these problems addressed before they turn into something much more serious. And painful. And costly. I know this is a serious expense for those without insurance. But in this case nothing is gained by delay. Dig deep and find the money in the budget, then keep up with your hygiene. Speaking of gingivitis, get on top of your flossing. A healthy mouth is an asset, and if you've got a healthy mouth, it's cheap to maintain it. Yes, dental floss costs money. But an ounce of prevention is worth a pound of cure. This is one area where you really should spend the money to maintain your health. Again, it's about valuing yourself. You'll thank yourself later if you start doing this before you're old enough for a sugar-heavy western diet to catch up with your teeth. You know it as well as I do. Exercise and diet are the cornerstones of good health. We've all heard it so many times before. Every day is a chance to start a new healthy habit. So skip the sugary sodas and chips. Prepare healthy meals based on seasonal vegetables and other real foods. Get outside every day (yes, you'll get a pass for blizzards, hurricanes, and nuclear war) for some productive or recreational activity, or at least an aimless walk. If you live in the city, skip the car or bus and walk as much as you can for your errands. Take the stairs. Park as far out in the parking lot as you can, and always walk your grocery cart back to the store. Or carry a hand basket instead of using a grocery cart for some weight bearing exercise. Walk your dog farther and more often. You needn't pay for a fancy health club membership to add more activity to your life. But I do recommend giving high quality food a very high priority in your monthly budget. Cooking from scratch as much as possible will help you eat well without spending a fortune, even if you pay a premium for fresh, local, chemical- and hormone-free foods. Routine screening tests, such as a pap smear, mammogram, prostate check, colonoscopy, dental cleanings. Many people make a conscious choice not to have mammograms and other radiological checks, even if their insurance will cover the test. Again, I'm not going to argue health care philosophy here, and I do think some routine annual medical tests are probably unnecessary for a lot of people. But most likely there's a regular exam that makes sense for each individual. If family health history places you at high risk for any diseases, schedule a routine check. Don't put off such tests simply because they're unpleasant. Budget for the tests that make sense for you and get yourself to those appointments. If there's an herbal cold remedy or immune system booster that you believe in, stock up on it now. Cold season is coming for us northern hemisphere types. If your home gets very dry during the winter months, think about ways of adding some moisture to the air of your home without resorting to an electric humidifier. Dry air probably contributes to the common cold by drying out the mucus membranes in the nasal area. So keep a pan of water on the woodstove or the radiator. Or hang your laundry to dry inside. After a shower, set up a fan to blow moist air out of the bathroom and into the rest of the house, rather than venting it outside. Advanced Frugal Action Item: If you're an ambitious sort, or simply enjoy gardening, consider planting a few medicinal herbs to have on hand for your family's use. I recommend you begin with safe to use and easy to grow herbs such as peppermint (used to treat fevers and headaches), chamomile (stomach aches, ear and eye infections), lemon balm (insomnia and tension), comfrey (skin conditions, burns, and wounds) or sage (sore throat, canker sores, digestive complaints). Obviously, this is an enormous topic that I cannot begin to cover here, and you should consult a professional herbalist or health care provider to address any serious medical situation. But there are many resources to guide those with an interest in herbal medicine. Growing a few of your own medicinal herbs is a great step on the road to both self-sufficiency and frugality. As with the food you eat, it's always nice to know where your medicine came from.